Woman In Digital: Does Shaving Bring Out The Best In Him? Does Shaving Bring Out The Best In Him? I hate beards, but my husband won't shave. I always tell him he looks great without a beard but the more I tell him to shave, less likely he will comply. However, I found the answer to this, by simply requesting to trim instead. Last weekend, I attended the launch of Philip's new campaign, "Be Your Best You". Designed to bring out the best in him Philips shavers empowers men to look their best and feel confident. 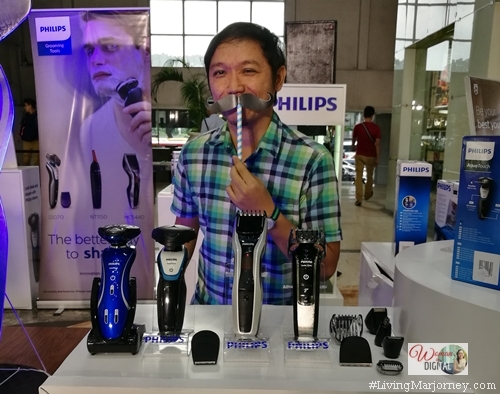 Philippe Gadgets & Accessories, Philips official distributor for Personal Care products together with its retail partner Rustan’s encouraged consumers to be in best look by trading-in their old traditional and electric shavers with the new Philips shaver. Many men are worried that shaving every day may cause skin damage. To combat this, Philips offers wide range of shavers to address the root cause of irritation - friction between shavers and the skin. All shavers designed to relieve discomfort and allow men to shave with maximum comfort, every single day. The Philips AquaTouch Wet & Dry Electric shaver promises to protect the skin while having a refreshing shave. The MultiPrecision Blade System with rounded profile heads glides smoothly across and its designed to protect the skin. For stylish and adventurous men, the Philips Multigroom series 3000 3-in-1 Beard & Detail trimmer allows to try different beard, mustache and side-burn styles. With three (3) attachments, it gives the possibility to easily try many different looks.